In an ideal world other vehicles driving on the road would pay the same amount of attention to your motorcycle as they do to other trucks and cars. They don’t, however, leaving every motorcyclist with no other choice than to learn how to ride defensively. While defensive riding might sound a little bit too “Mad Max” for you, it’s actually about learning how to avoid accidents before they happen, while asserting your place on the road or motorway. It has absolutely nothing to do with aggressive riding. Never, ever drink alcohol when you’re riding a motorcycle. In fact, you should never attempt to ride a bike when you’re under the influence of any substance, including what are considered “harmless” drugs. Your reaction times are reduced, and your judgment will be impaired, increasing the risk of a serious accident. That extra split second in your reaction time is the difference between avoiding an accident, and becoming a statistic. We’ve already covered the topic of protective motorcycle clothing in another post, but we’re going to mention it again: you should always wear protective clothing when riding your motorcycle. At the bare minimum you should wear a helmet, sturdy gloves, and an armored jacket. Protecting clothing doesn’t make you invincible, but it does offer you 100% more protection than wearing no protective clothing at all. Experienced motorcyclists wear protective clothing all year round. Inexperienced riders don’t. It’s that simple. A big part of defensive riding is making other motorists aware of your presence on the road. This means keeping your DRL(daytime running lights) on at all times, wearing protecting clothing that makes you easily visible to other drivers, and using the horn on your bike to remind drivers that you’re there. You need to scan your environment every time you ride. This can be difficult because there is the temptation to zone out while riding, but that’s exactly when accidents happen. Proactively avoiding threats involves overtaking the guy on the smartphone in the car in front of you. It means signaling that car at the junction to pull out ahead of you, especially if they’re a learner driver. Maintain a safe distance between you and the cars around you, leaving room to react in dangerous situations. If that’s not possible put distance between your bike and any careless driver near you – it’s not worth the risk. You should also monitor the road surface ahead of you for debris, potholes or anything which could cause you to lose control of your bike. You have as much right to ride on the roads as any other driver, so don’t be afraid of asserting yourself. You don’t need to be aggressive to do that, but you do need to occupy your lane, letting other drivers know you’re there by riding just off-centre of the lane. Aggressive riders will try to dominate other cars on the road, forcing them to change lanes to avoid an accident. This gives bikers a bad name, and also results in fatal accidents for a very high number of aggressive motorcyclists. Whenever possible pull away from a junction, or cross an intersection, while keeping a car on your flank. If somebody decides to blow through a red light, they’ll hit the car instead of your bike. Ideally they won’t attempt to jump the lights because there’s a car in front of them, whereas motorcyclists are often ignored by careless drivers. Car drivers can be your friends, especially when it comes to dangerous or busy junctions. Even a bike with a relatively small engine capacity is capable of quicker acceleration than most cars or trucks, but you need to use that extra power with care. Never overtake unless you can see your exit and entry point clearly i.e. that the road ahead of you is clear, and that there’s enough space ahead for you to pull into. Overtaking on a blind corner, or against oncoming traffic , is the quickest way to get yourself into a bike wreck. When you do overtake make sure you’re in the right gear, use your signal lights, and leave space between you and the car or truck you’re overtaking. 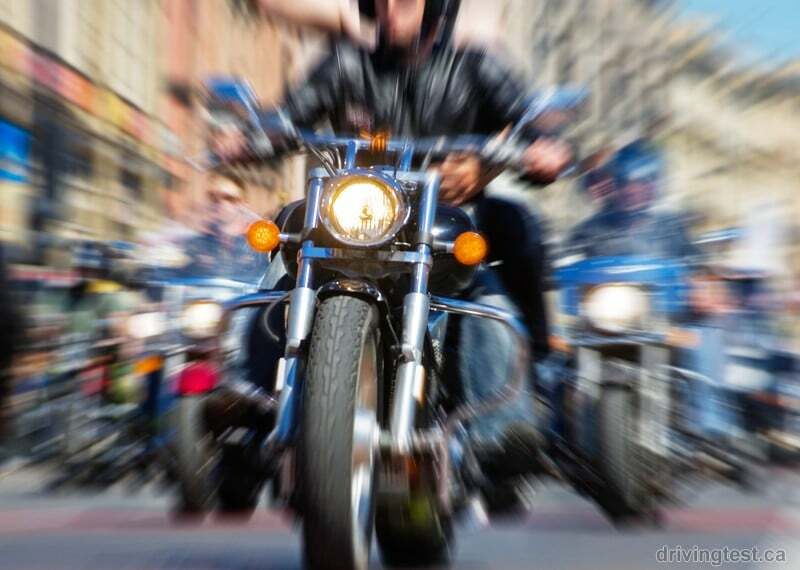 There’s no denying that part of the attraction of riding a motorcycle is the sheer thrill of the speed they’re capable of. When this speed is used responsibly you can have a lot of fun riding solo, or with your buddies. The issue is that inexperienced riders think speed solves all their problems, and is part of being a good defensive rider. If you have an accident at speeds of up to 80mph there’s a good chance you’ll survive. If you have an accident at speeds of over 120pm it’s unlikely that you will survive. Be smart about your speed – use it when you need it. Defensive riding isn’t something you learn in a long weekend of riding. Instead you should focus on learning one aspect at a time, honing your skills to perfection. Once defensive riding becomes a daily habit for you, you won’t even notice you’re doing it.